In 1967, artist William Gropper completed a series of five windows in the Gottlieb Community Hall at West Suburban Temple Har Zion in River Forest, Illinois. 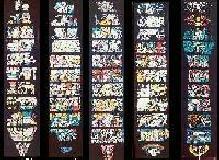 We are proud to present a celebration of these vibrant windows which represent some of the most familiar stories of Genesis. 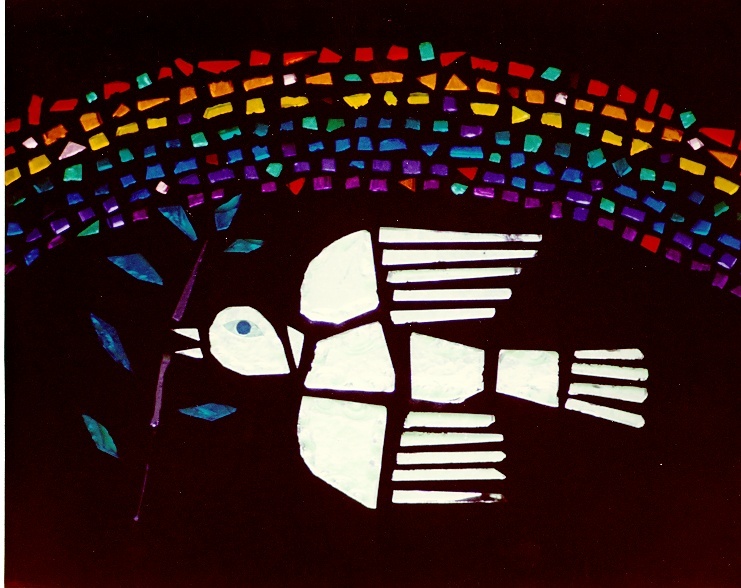 Instead of traditional stained glass techniques, Gropper used one inch thick chunks of brilliantly colored glass which were cut to shape and chipped or faceted on the surface. The five windows, each containing 11 panels, were made by the Valeska studios in Chicago and are over two stories high. The five individual windows and their stories. Magnificent Walls A larger image of the complete set of windows as well as a photograph of the massive sculpture, "Not by might . . . " by Milton Horn on the east wall at West Suburban Temple. The artist and more Information about the artist and links to other collections of art works and related sites. Information about Temple Har Zion and the Oak Park/River Forest Community. Guest Book Please let us know what you think about these pages. Miscellany Here you will find an e-mail link, honors, credits and other information as well as a way to show your appreciation of these pages. 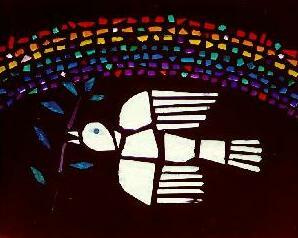 Return to Top Introduction and the Dove and Rainbow image. In order to facilitate loading, all of the images on this page have been kept fairly small and at a low resolution. However, many of the images on these pages are linked to larger truecolor files to enable you to see them in closer detail. The Gropper Windows constitute the East wall of Gottlieb Community Hall at West Suburban Temple. Each window is two stories high and consists of 11 panels of chiseled glass set in a matrix. Although the windows are, in reality, separated by brick columns of approximately the same width as the windows themselves, we have included a composite picture which eliminates the bricks. Ambient light makes photography of the entire wall quite difficult. The brilliance and magnificence of these windows can only be appreciated in person. You are invited to visit West Suburban Temple Har Zion. In addition to the Gropper Windows, West Suburban Temple has an eclectic collection of other works of art, including the once controversial, bas relief, "Not by might..." by sculptor Milton Horn which adorns an exterior wall of the Temple. This link leads to a larger version of the composite picture shown above as well as to a photograph of the Horn sculpture. William Gropper was a fascinating and controversial individual. These windows were his first efforts in glass. We have collected a small number of links to other works by the artist and to biographical information about him. Additional suggestions will be appreciated. Guests are always welcome at services at West Suburban Temple. If you wish to visit at other times please contact the Temple administrator to make arrangements. For more information visit the West Suburban Temple Har Zion home page or contact Carol Serber, Temple Administrator at cserber@wsthz.org or (708)366-9000. For information about other places of interest in Oak Park and River Forest, and much, much, more visit The Oak Park Tourist. Please leave your comments in our Guest book or send your private comments by e-mail. We are proud to announce that The Gropper Windows pages have received the Web Design Group (WDG) Award for excellence in design. The pages have also been recognized as a speech friendly site. The pages were selected as the first "Currently Featured Site" on Gene R. Thursby's Religion, Religions, Religious Studies Page, the premier index of religion related sites. The Gropper Windows pages were also featured on the worldwide radio broadcast The Internet Minute On December 7, 1998. All Gropper related images and text copyright West Suburban Temple Har Zion. Photographs of the Gropper Windows by Dr. Howard Berlin. This page created and maintained by Leonard Grossman who has his own wholly unrelated pages Reflections of a ModemJunkie. is maintained by Leonard Grossman. The French version of this page and the translation back to English were entirely machine translated by Systran Software. They are presented solely as demonstrations of computer generated translations. Send me your comments.